Many details in the biography of anatomist Andreas Vesalius have been confirmed as hoaxes in the past few decades. The most malicious ones concern his alleged trouble with the Inquisition and his death in a shipwreck. Nobody can ignore, though, the sources proving that Vesalius travelled to the Holy Land as a devout pilgrim with the support of his employer, and that, upon his return, he did not die on a deserted beach along the Ionian coast, but expired in Zakynthos, where he was buried in the Santa Maria delle Grazie Church, now destroyed. There is, however, one major problem with this particular lemma, supported by the prestigious Massachusetts Institute of Technology. The portrait on the page does not represent Vesalius. Pantheon shows the portrait of Melchior von Brauweiler, a lawyer from Cologne, Germany. “Help us improve our data,” M.I.T. requests on every page entry and so I informed them of Pecker’s article. From the answer I received on April 1, I understand they are still convinced this is Vesalius because Wikimedia Commons says so and because it is free, and that, if I want to argue, I will have to do so with Wikipedia and the Smithsonian that posted it[iii]. That ended my exchange with the influential M.I.T. There is worse to come: the French journalist and writer Henriette Chardak used the portrait of von Brauweiler on the cover of her biography, Andreas Vesalius: Surgeon of Royals[iv]; how deep did her research go? There are even more substantial pranks that continue to survive today, but let us first recap some facts of Vesalius’s life (as you can imagine, I have not consulted Chardak’s biography). Born as Andries van Wesel (1514), Vesalius moved from his hometown Brussels to Louvain, in 1530, for his secondary studies. He learned his classical languages at the Collegium Trilingue, the institute run by the humanist Erasmus. In Louvain, Andries van Wesel, ironically, became Andreas Vesalius Bruxellensis. In 1533, he moved to Paris to proceed with his medical studies. Political unrest, however, brought him back to Louvain in 1536, where he graduated with a bachelor’s thesis avant la lettre, a commentary on a book of the Arab/Persian physician Rhazes. He didn’t stay long in Louvain. When a new rector was nominated, the atmosphere had become somewhat darker, and Vesalius, attracted by the intellectual light that shone from the south, went to Padua in 1537. In December of that year, he obtained his Ph.D. avant la lettre, and immediately got a chair as professor of surgery and anatomy at the University of Padua. In these most active years, he also wrote his magnum opus, the Fabrica. Then Vesalius received an offer he couldn’t refuse: Charles V, ruler of the Holy Roman Empire, wanted him, the descendant of a family who had worked for the Royals for generations, as family doctor. I admit that I’m racing through Vesalius’s biography and beyond academic speed limits. Between birth, five hundred years ago, and death, four hundred and fifty years ago, his life of fifty is far richer than I make it out to be here. Moreover, the map of his life still shows a few blanks, especially at the end, many of these linked to his departure from Spain and his voyage to Jerusalem. On the occasion of a previous anniversary of his birth, in 1914, physician and historian George Matheson Cullen already contested seriously a series of reasons why Vesalius supposedly left Madrid. Despite Cullen’s well-developed response, also in additional publications such as “Vesalius and the Inquisition Myth”, many of these allegations inexplicably survive until today. As with the allegations already countered by Cullen one hundred years ago, many of their questions have been answered by now, some by the trio itself in a coda to their articles. 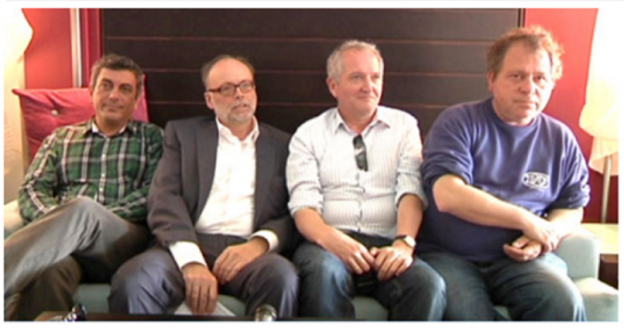 Some related questions got their answer during the international Vesalius Continuum Conference, which Belgian biomedical artist Pascale Pollier, President of the UK Vesalius Steering Committee, Dr. Mark Richard Gardiner, and I organised in September 2014 on the island of Zakynthos. Meanwhile, I’ve been trying to find an answer to the ultimate question that concludes those raised by Cullen and the Belgian trio: where on Zakynthos is his grave? Where are his remains? The question of the whereabouts of his grave was initially raised by Pollier, who still dreams of making a facial reconstruction of Vesalius’s skull, so we might finally know what he looked like. Always attracted by graves and cemeteries, this Quest for a Lost Grave was undoubtedly my cup of tea. I haven’t found the grave yet. However, as told in my book, In Search of Andreas Vesalius, I’m close, very close. 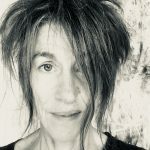 Jacqueline Vons, the French translator of Vesalius’s Fabrica, who reviewed my book, stated: “If itsucceeds in stopping the legends and rumours that still surround the death of one of the greatest Western minds, this book has its place in science. [viii]” Nice to hear from such a prominent medical historian, but if real researchers (like her, Cullen and the trio) do not even succeed in countering the dozens of pranks I’m listing here, I predict my place will be very modest. But I persist and, with a little help from my friends, I firmly denounce outdated notions, solemnly stating, and joining them in their proofs, that Andreas Vesalius did not travel to the Holy Land under pressure of the Inquisition, neither as penance nor escape: he went there as a devout pilgrim with the support of his employer. Upon his return from Jerusalem, he did not die on a deserted beach in the Ionian Sea, the only victim of a shipwreck. Weakened by his travels in the Holy Land and by an unfortunate return journey, he died in Zakynthos and was buried in the Santa Maria delle Grazie Church. All this is based upon historic sources, recently discovered or rediscovered by the infernal trio I keep on consulting: Steeno, Biesbrouck and Goddeeris, together a kind of Cerberus, the three-headed dog that watches over everything that is published on Vesalius; three musketeers who, since my book, have welcomed me as their fourth partner. In January 1564, Philip II sends word to the Embassy of Spain in Venice, asking them to assist his doctor Andreas Vesalius in all possible ways, to enable him “to get to Jerusalem safely so that he can return swiftly to his post and resume his work for me”. Two weeks later, March 28, the Embassy reports that “the troop transport for Cyprus and Corfu, with Vesalius on board, could not sail because of bad weather”. 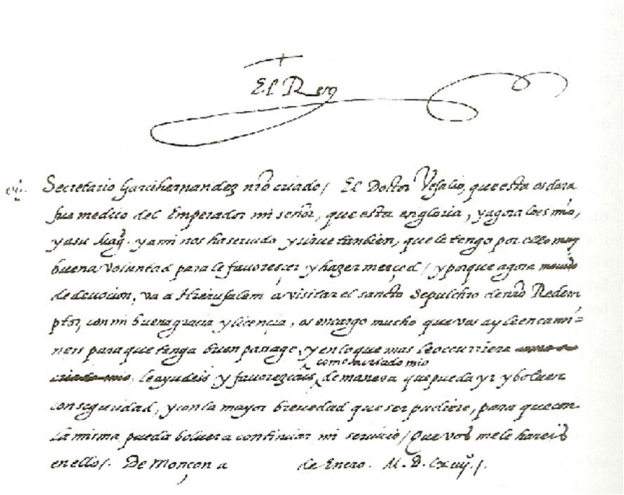 The fourth letter is dated May 29, 1564: the Nuncio and Custodian of the Holy Places thanks Philip II “for the royal gift of five hundred ducats that Dr. Vesalius, pious pilgrim, has brought as an aid to the shrines for the Catholic faithful in Jerusalem”. What is there to misunderstand in these letters? Vesalius was on a pilgrimage, a diplomatic mission, or both. He did not travel to the Holy Land under pressure of the Inquisition. Until today nobody has come up with an official document issued by the Inquisition. I already promised a crate of champagne to the first who succeeds; meanwhile Omer Steeno has offered a second crate. As difficult to erase is the guess that Vesalius died in a shipwreck, even though a letter it transported reached its destiny. Very recently, our Belgian trio discovered a report that further contradicts that legend[x]. Hidden in an 18th century book by Thomas Theodor Crusius about “fancy stuff to know” was a report about Vesalius’s end, dated May 1566. The author is Reinerus Solenander, a German medical doctor who also studied philosophy in Louvain. The report describes in detail that weather conditions, specifically headwinds, storms and windless days kept him and his fellow travellers at sea for so long that they ran out of food and water: many died and to his dismay were thrown overboard. 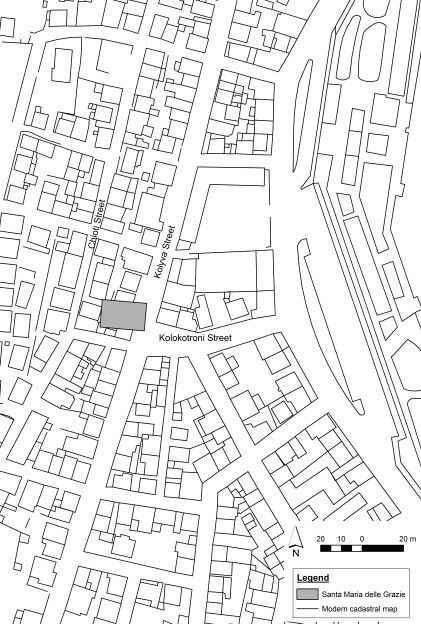 From the details in Solenander’s report, it is clear that Vesalius made it to the port of Zakynthos. Moments after his arrival, though, he collapsed. The symptoms may point in the direction of scurvy as the cause of death, as argued by Pavlos Plessas, a Zakynthian history blogger at our conference, and certainly to a fatal fatigue. “Cerberus” also discovered the German account of a journey Fürer von Haimendorf undertook in 1565, arriving in Zakynthos on August 6, less than ten months after Vesalius’s death. In that account von Haimendorf describes in detail the burial place of Vesalius in the Catholic church of Santa Maria delle Grazie. Vesalius was not buried in a remote monastery of Laganas, the deserted and somewhat mythical beach where he was allegedly stranded after being shipwrecked – he was buried in the centre of town with the regard a man of his standing deserved. But this church, sacked by invaders, converted even to army barracks and damaged by multiple earthquakes, has vanished under the urban network that rose from the ashes of the most devastating earthquake of August 1953. 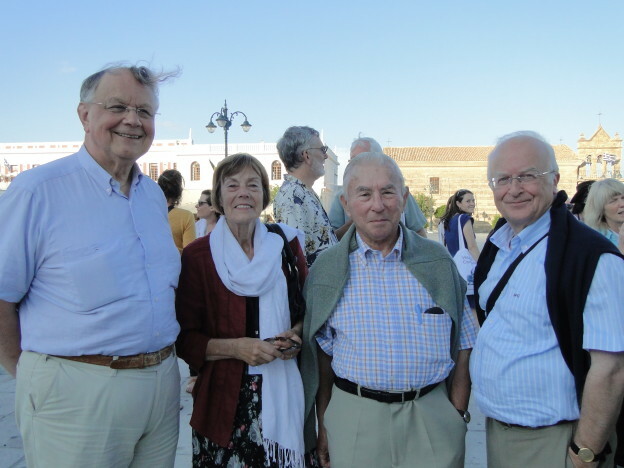 In April 2013, I invited Professor Jan Driessen (Université catholique de Louvain, UCL), also Director of the Belgian School in Athens (EBSA), together with Dr. Apostolos Sarris, Deputy Director of the Cretan Institute for Mediterranean Studies at the Foundation for Research and Technology – Hellas (IMS-FORTH) to the Ionian island. We explored the possibility of developing a multi-layered digital map, a geographical information system (GIS), composed of ancient and more recent maps to pinpoint the exact location of the church. In February 2014, Agfa HealthCare, the world leader in medical imagery and part of the Belgian group Agfa-Gevaert, offered its support for the expertise of a GIS specialist in funerary sites: Sylviane Déderix, Belgian Research Fellow of the National Fund for Scientific Research, UCL and IMS-FORTH. Now that she found out, from this reconstructed map, where the church was situated, we still have to check using non-destructive ground-penetrating radar (GPR) and electrical resistivity tomography (ERT) methods on the ground. A number of test or rescue excavation trenches may also be needed to validate the results, and in order to request a dig permit. Minor detail: for these phases II and III, we’re still looking for funds. If somebody wants to make history too, he or she should write to me immediately. I can only hazard a guess as to why we meet with so much scepticism, why the undeniable research of the trio and their predecessors is not picked up and why not everybody is keen to find Vesalius’s skull. The fact that my Vesalius mentors publish in specialised journals and magazines may explain why the general public remains unaware of the facts. However, why so many writers, journalists, Vesalius biographers, M.I.T., the Smithsonian and others keep on repeating the same old urban legends, I do not know. Of course it is easier to copy or repeat stories than to do painstaking historic research from scratch; this latter is usually unrewarding and unpopular. While Cerberus has been studying Vesalius for decades, I fear many others are just trying to make a quick buck during the commemorations. From a bibliography of almost three thousand titles about Vesalius, collected by Maurits Biesbrouck, it appears that 12 % was published in a single year, 1964, the previous commemoration year; I suppose the percentage will be beaten by far in 2014 and 2015, exactly fifty years later. Not only laziness and an easy buck can explain why hoaxes like the portrait of von Brauweiler and the rumours around the Inquisition or shipwreck, refuted decades ago, are still perpetuated today. Maybe the Vesalius culprits ignore the findings because these do not match their own opinions, ideas or convictions? For example: although proof of a sentence by the Inquisition is missing, Vesalius had to be a victim of the church because this story fits the contemporary agenda of those who claim that science and religion are incompatible. So it is too with the collection of portraits and busts of Vesalius that fill museums all over the world. They all reflect more the intention of the portrayer than the subject, because nobody knows exactly what he looked like, and so we see Vesalius from grave robber to imperial doctor, or as a wonder kid, a wise old man, an ill-tempered redhead, the scientist as saint, the anatomist as devil – or Vesalius not as Vesalius at all, as in M.I.T.’s Pantheon. As already mentioned, one portrait only was approved by Vesalius himself, the one in the Fabrica. But then, certain features, namely the knobs on his forehead, the dimensions in general, the height of the table and the difference in length of his own arm and the arm he is dissecting, have led to the assumption that Vesalius had dwarfism. There is however not a single source to confirm this. The portrait is most likely a patchwork of two pictures: Vesalius as he fancied himself, fairly overdressed for the occasion, and the detailed drawing of a dissection. Hoaxes are not only enforced because it’s easier to repeat them than to prove them wrong, or because they have to fit a personal agenda. Hoaxes also sell better than the truth – especially if they are juicier, more romantic or spectacular. In my book, I refer to our taste for mysterious tales, conspiracy theories, whodunits and thrillers. How many of the biographies and reference works published this year fill in the blanks with fiction and their authors do not even pretend they are novelists. It completely fits with the tabloidisation of our culture. Taphophiles of the world, unite! 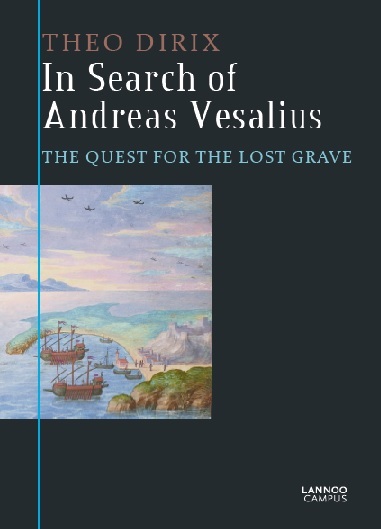 In The Search of Andreas Vesalius: The Quest for the Lost Grave, I also try to tell a good story, but I don’t play with the facts. For the serious research and the most advanced archaeological techniques to be taken seriously, I felt compelled to wrap them in a personal account of a taphophile, in an adventure of a tombstone tourist set on an island known for its dead poets. Exposing hoaxes motivates me to continue looking for our anatomist’s skull and I urge my mentors to look for more documents and references. After all, who would ever have imagined that a copy of a Fabrica would show up as it did in 2007, containing within it hundreds of Vesalius’s annotations – proof that he was preparing a third edition? 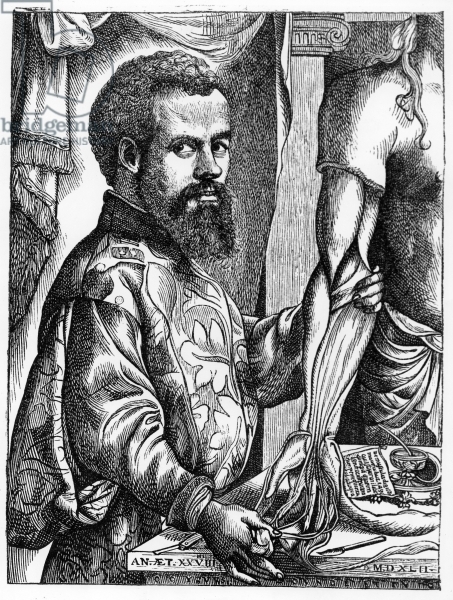 Andreas Vesalius did not travel to the Holy Land under pressure of the Inquisition, neither as penance nor escape. He went there as a devout pilgrim with the support of his employer. Upon his return, he did not die on a deserted beach on the Ionian coast, the only victim of a shipwreck. Rather, he died in Zakynthos, where he was buried in the Santa Maria delle Grazie Church[xi]. [ii]André Pecker, Contribution à l’étude d’un tableau de Calcar, in Congres Bazel, 1964, p. 80. [iv] Henriette Chardak, Andreas Vesalius: Chirurgien des rois, Presses de la Renaissance, Paris: 2008. [v] Inspired by the biographical notes of Maurits Biesbrouck: http://home.scarlet.be/~p4u02764/ (accessed on 08 March 2014). [vi] Advocates of the ideas of Greek physician, Galen, questioned by Vesalius. [vii] George Matheson Cullen: The passing of Andreas Vesalius. Edinburgh Medical Journal, 1914, 13, p. 326. [viii] Jacqueline Vons, Histoire des Sciences médicales, Tome XLVIII, nr.4, 2014, p.551. [ix] The letters are quoted by Maurits Biesbrouck and Omer Steeno with translations and comments in ‘The last months of Andreas Vesalius. Part I’ in Vesalius, Acta Internationalia Historiae Medicinae, 2010, 16 (2): 100-6. [x] Find both sources, Solenander and von Haimendorf, in Maurits Biesbrouck, Theodoor Goddeeris and Omer Steeno’s, “The last months of Andreas Vesalius: a Coda” in Vesalius – Acta Internationalia Historiae Medicinae, 2012, 18 (2); 70-75. [xi] With thanks to Omer Steeno, Maurits Biesbrouck and Theodoor Goddeeris. Apendice IX. Carta de Felipe II a Garcihernandez, su embajador accidental en Venecia (Archivo de Simancas, Estado Venecia. Leg 1325, fol.68). 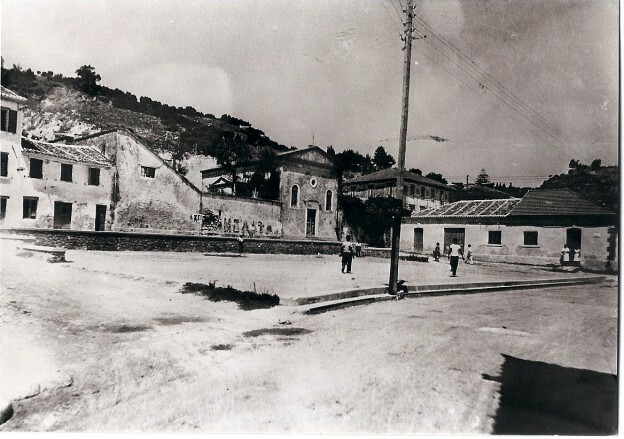 3: Santa Maria delle Grazie Church before the earthquake of 1953, photograph private collection Spiros Gaoutsis, Corfu, Greece. 4: Apostolos Sarris (Deputy Director IMS-FORTH), Theo Dirix (Consul of Belgium in Greece), Jan Driessen (Prof. Université Catholique de Louvain and Director of the EBSA (Ecole belge d’Athènes/Belgische School te Athene) and Akis Ladikos (former Deputy Mayor for Culture, Zakynthos), photograph in Imera Zante Newspaper, 24.04.2013.